It was a full house, and even arriving a little late, it was a very entertaining show and spotlight on the worst practices of corporations with regard to the climate change issue. The winners were: Chevron, EDF (a French electricity company) and BNP Paribas (French bank heavily into coal and fossil fuel resource financing - see Banktrack), but there was some pretty stiff corporate competition. The Australian votes for Engie, who own the Hazelwood coal mine and power station, just wasn't enough to earn them a Pinocchio. 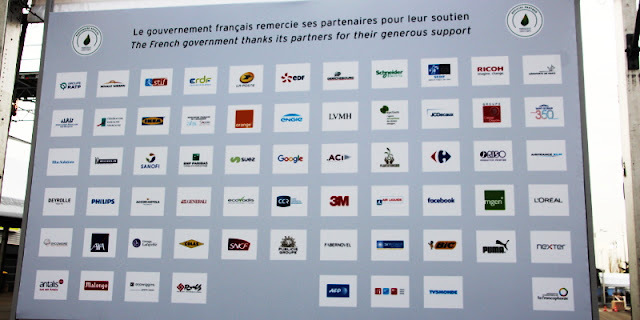 Surprisingly, only one bank, BNP Paribas, became a sponsor of the Climate Conference. That bank has major investments in coal and fossil fuels (It received a Pinocchio award). BNP Paribas alone accounts for half of the total support - now totalling more than 30 billion euros - provided by French banks to the coal industry between 2005 and April 2014, according to the 2014 Banktrack report. Other French banks are not represented in the sponsorship list. The UNFCCC secretariat, in a leaked document, suggested this is because of "strong pressure from some NGOs to conduct a divestment policy in certain mining projects, including coal" that lead the sector to "fear to face a backlash if too large visibility within the COP." Engie is refusing to pay an $18 million bill from the Country Fire Authority for the tough and dangerous job of putting out the minefire, a situation exacerbated by Engie's negligence for many years of onsite fire fighting equipment. Joe Elan from Brandalism said in a media release, "By sponsoring the climate talks, major polluters such as Air France and GDF-Suez-Engie can promote themselves as part of the solution - when actually they are part of the problem." "We are taking their spaces back because we want to challenge the role advertising plays in promoting unsustainable consumerism. Because the advertising industry force feeds our desires for products created from fossil fuels, they are intimately connected to causing climate change. As is the case with the Climate talks and their corporate sponsored events, outdoor advertising ensures that those with the most amount of money are able to ensure that their voices get heard above all else." concluded Elan.